Process Not Product is a familiar phrase at our school. We want to give people the tools to replicate what they do at the field school after they leave. If it were just about ending with a finished product, we might do things differently. But for us it’s about giving people the tools to create that finished product on their own. As such, our emphasis is on the process. And if we do it right, the product will take care of itself in the long run. Learning is a process that takes place over time, but the amount of time varies from person to person and situation to situation. Some people can do something once and immediately understand the big picture in a moment of clarity, while for others it can take a long time and a lot of repetitive work to reach that same “A-ha!” moment. But it isn’t a race or a competition; it’s a journey. Each person takes exactly the amount of time they need. I’m not promoting a form of new-age educational relativism, but rather the idea that real learning, not simply rote memorization or duplication of a specific task, takes time and won’t be rushed. It’s impossible for a teacher to hit a button inside of a student’s head and make them “get it”. But through experience good teachers understand how to create situations that lead the student to where there is a strong chance they’ll get it. And if the student doesn’t get it, a good teacher has other tricks up his or her sleeve and is ready to create other situations to help the student learn. And they’ll keep trying until the student gets it. A great example of this is making bows. I like to have people make 4 bows to learn the skill. First they make the 2-minute sapling bow, then the 4-minute bundle bow, then the 4 hour rough bow, and finally the 3-day long bow. 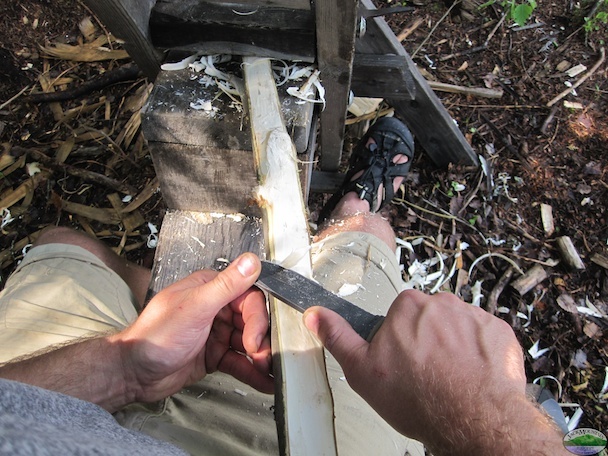 The idea is that at each step along the way they learn more about bowmaking by understanding the concepts and using the tools with greater dexterity. There are lots of people who could jump right to the longbow, but most would be taking direction and carving wood without knowing where their work fits into the bigger picture until they’re nearly finished. This is a fine route if the goal is to have a finished longbow, but not when the goal is to learn how wood bends and how to make bows that last. The first example is focused on the finished product, while the second is focused on the process. In the first example, the student will constantly be asking the instructor if it looks right, while with the second the student understands where they’re headed, knows what they’re trying to accomplish, and needs the help of the instructor much less frequently. The end result is that a person who built a bow will talk about how talented their instructor was. The person who learned the process of making a bow will realize how talented they are.